Deal with included 10% OFF Coupon! PREMIUM QUALITY:BESTOPE Makeup mirror surface is designed with premium quality coating, which turns out to protect the mirror surface. Unlike other cheap products, this high quality mirror is more sleek and polished, ensuring the best experience! 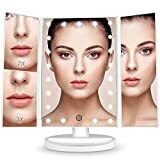 1X/2X/3X MAGNIFICATION MIRROR: 3 panels magnifying and a wide-angle viewing for you to see clearly your facial features and make a more perfect makeup with each detail taken care of. 21 PIECES LED LIGHT: Our Vanity mirror is built-in 21 pieces adjustable Leds, allow you makeup in the dark or poorly lit areas. LED lights brightness adjust by the touch sensor switch. 180-DEGREE FREE ROTATION: The lighted makeup mirror stands on your countertop can be freely adjusted and fixed a perfect and comfortable viewing angle. Tri-fold and detachable design makes you can take it anywhere you go. DOUBLE POWER SUPPLY: This Led mirror can either operated by 4 pcs AAA batteries (not included) or USB cable (usb wire included)to make it work, mirror can not store power itself.